With 10 days to go until a deadline for President Donald Trump to decide whether to keep the United States in the Iranian nuclear agreement, public backing for the deal matched a record high in a nationwide poll that also shows net support at its highest level. A Morning Consult/Politico survey — conducted online April 26 to May 1 among 1,991 registered voters — shows 56 percent of respondents back the agreement reached in 2015 between former President Barack Obama, Iranian leaders and the heads of five other countries and the European Union to lift economic sanctions against Iran in exchange for its pledge to halt efforts to develop nuclear weapons. That matches a previous high from an April 2017 poll. Net public support is at a record level — 30 percentage points — in the most recent survey. 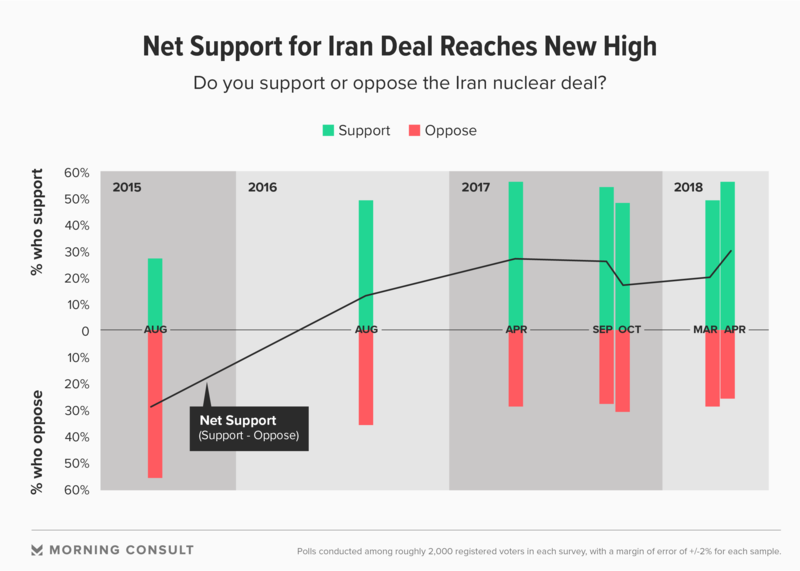 The share of voters opposing the deal — 26 percent — is at the lowest point since Morning Consult began tracking the topic in August 2015. Sixty-eight percent of Democrats and 51 percent of independents said they support the deal, which has been pilloried by Republicans since its inception. GOP voters were split: Forty-six percent backed the deal and 42 percent opposed it. The poll carries a margin of error of plus or minus 2 percentage points. Trump has repeatedly criticized on the agreement, also known as the Joint Comprehensive Plan of Action, and did not certify it in October. It has survived, though. Congress decided against reimposing “snapback” sanctions which could have been triggered by Trump’s decision not to certify the agreement, and inspectors with the International Atomic Energy Agency have continued to confirm that Iran is complying with the deal. As part of the agreement, Trump is required every 120 days to decide whether to reimpose the economic sanctions. In January he said he would waive sanctions one more time to allow for “a last chance” for European allies to secure a new agreement, setting up the May 12 deadline. During his official state visit in Washington last week — the first by a foreign leader during Trump’s presidency — French President Emmanuel Macron spent part of his time trying to persuade Trump to remain in the deal. “What do you have as a better option? I don’t see it,” he said during a Fox News interview that aired April 22. During a Monday news conference, Israeli Prime Minister Benjamin Netanyahu accused Iran’s leaders of lying about the country’s prior attempts to craft a nuclear weapon when it signed the 2015 deal.